It's summer time somewhere in SL! Time for baseball, picnics, and camping. Time to top your outfit with a carefree Baseball Cap, to keep the SL sun out of your eyes! These delightful, fully textured caps have a color change script that lets you pick from 11 different colors to suit every mood. The colors are real textures, too, not tints; so the embroidery looks perfect every time. Included in the package are copies of the cap that use the Nose, the Chin or the Mouth as an attachment point, so you can wear one that doesn't conflict with your other attachments. All caps are copy/mod; so you can resize one, then make a copy in each tint and throw away the scripts, if you're concerned about lag! They are perfect for boys or girls of any age (including the big, grown up ones!) Available from Kick the Can in world, or choose from a limited selection on the SL Marketplace. Caps are L$200. Copy/Mod/NO Transfer. 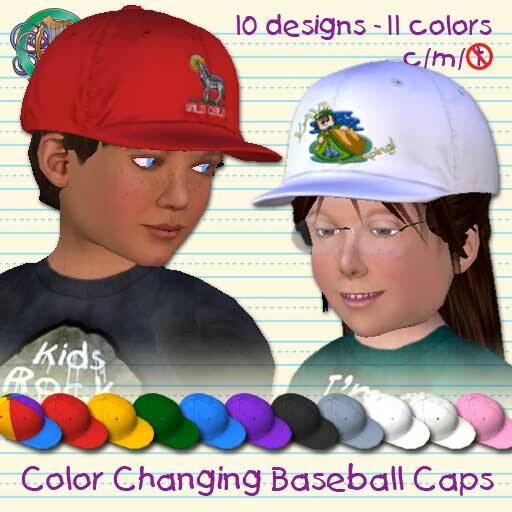 You can buy the Plain cap, the Gone Fishing cap, the Li'l Stinker cap, the Roses cap, the Wild Child cap, and the Yay!! Camping! cap from the SL Marketplace, or you can go to Kick the Can in Livingtree in world, and purchase any of them there.